The kitchen in the café at First American Financial Corporation where Elizabeth Martinez serves as job coach for Brian Hirayama, Daniel Martinez, and Alfonso Ponce—three young men with developmental disabilities—is a showcase for true integration of people with disabilities into the work force. Alongside co-workers without disabilities, these men perform their duties with pride and professionalism, helping the First American Café serve more than 1,000 people per day. The support, encouragement and lessons they receive from Elizabeth have been key to their workplace success, as well as the personal growth they have experienced as a result of their employment. Now in her third year as a job coach with Goodwill of Orange County (one of several agencies that RCOC pays, on behalf of the State of California, to provide supported employment services), Elizabeth began college as a criminal justice major. After an internship in that field, however, she decided it wasn’t the career for her and switched to sociology. Around the same time, a family member’s baby was born with cerebral palsy and epilepsy. That personal experience convinced Elizabeth that helping people with disabilities to overcome their challenges would be her life’s work and her passion. Professionals like Elizabeth – who love their work and who go the extra mile every day to serve people with developmental disabilities – are vital to the success of California’s regional center system of community care and developmental services systems throughout the United States. Equally important in this mix are employers like First American that step up and provide truly integrated work places where adults with developmental disabilities can succeed. First American has been a role model in the Southern California community, having embraced the developmental disabilities community for the better part of the last decade. In addition to the three men Elizabeth Martinez supports in the company’s employee Café, First American employs a team of adults with disabilities that handles important escrow and other financial documents by preparing the files, scanning documents, and distributing them to the appropriate departments. And even before the job coaches and employers enter the picture, effective adult transition programs at the schools there provide invaluable support by building functional skills, such as learning to take public transportation, and work skills like using a computer, time management and business etiquette. Just as important, an effective transition program also paints a picture that helps agencies like RCOC and others on the individual’s planning team to truly understand that student’s skills and interests. Ideally, a student is able to gain actual work experience in their desired field, which can enable them to go directly from their transition program into a competitive, integrated job in the community. 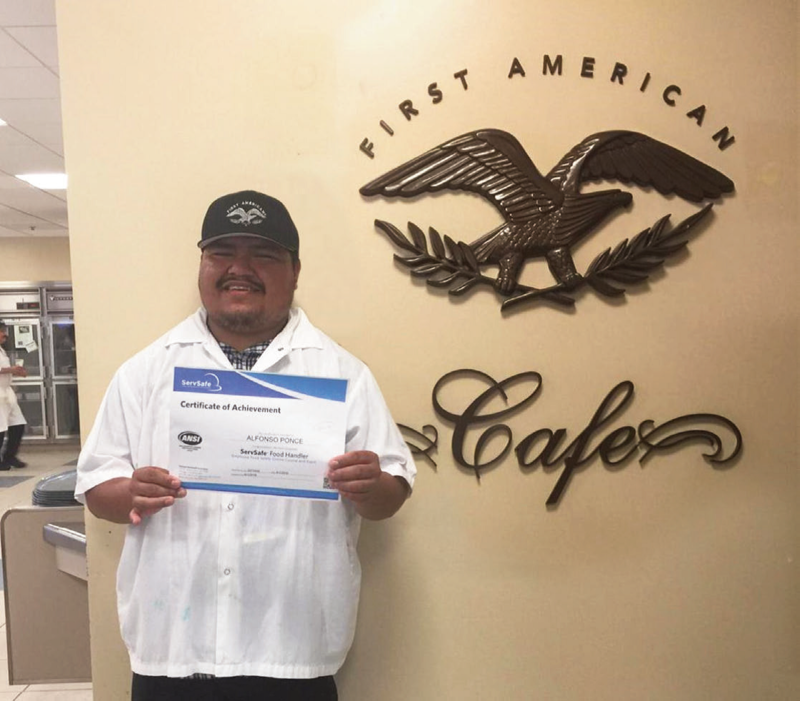 It is truly inspirational to see how all of these factors for workplace success came together for Alfonso, who began working at the First American Café following his transition program at Edison High School in Huntington Beach, California. According to Alfonso, working in a restaurant was always his dream and he was able to get restaurant experience through his transition program. At the Café, his duties are diverse, ranging from washing dishes, emptying the trash, and sweeping to folding boxes, organizing produce, and cleaning the walk-in freezer. His favorite part of the job, though, is washing the dishes and putting them in the dishwasher. Anyone visiting the kitchen at the First American Café could be forgiven for not recognizing sociable, confident and independent Alfonso, as the same person who began working at the Café just a couple of years ago. His job coach considers Alfonso’s transformation nothing short of remarkable. Elizabeth pointed to similar personal growth on the part of Daniel and Brian, both of whom have autism. Daniel, who started working at the Café at same time as Alfonso, was also very quiet and avoided eye contact, but that has all changed. The confidence he has gained from work and the daily encouragement he gets from Elizabeth to always look for ways to improve himself, also inspired Daniel to return to school. He now attends Irvine Valley College (a local community college) when he’s not working, and recently got 10 out of 10 correct on his first class quiz. Brian, who joined the team more recently, has nonetheless made great strides in learning to forge relationships with co-workers at the Café, and has blossomed with Elizabeth’s support. Of Japanese descent, Brian amazes his co-workers with his fluency in four languages – Japanese, English, Spanish and Chinese. He is even teaching others in the kitchen to speak Japanese. He has also learned to be more focused on the job, and has developed good listening skills, which help him to be successful at the Cafe. All three men take great pride in their work, are punctual and respectful, and regularly share their gratitude for the opportunity to work and earn a paycheck. Clearly proud of her team’s extraordinary personal growth, as well as their work ethic and job performance, Elizabeth applauded the Café’s Executive Chef Dore Sommer for providing a positive work environment. The young men’s parents have also noticed the positive effects of their having jobs in an integrated setting in the community. The supportive and fair-minded approach taken by Chef Dore – and by First American’s Vice President of Operations Frank LaBlanc, who oversees the company’s other team of workers with disabilities— is one that all employers would do well to adopt. It is a sensible and laudable example for engaging with both typical employees and employees with disabilities. We can never have too many job coaches like Elizabeth, who exude positivity, demonstrate the positive behaviors that lead to workplace success, and actively cultivate the abilities of every individual on their teams to grow and achieve. Larry Landauer is Executive Director of Regional Center of Orange County (www.rcocdd.com), in Southern California. RCOC is the private non-profit organization contracted by the State of California to coordinate services and supports to the more than 20,000 Orange County residents with developmental disabilities. PHOTO: NOW WE’RE COOKING: (Above) Alfonso with Executive Chef Dore Sommer. Working in a restaurant was always Alfonso’s dream and he was able to get restaurant experience through his transition program. Transitions: Moving from Pediatric Care to Adult Care can be Tricky. Here are 8 Questions to Ask Your Doctor to Facilitate the Process.